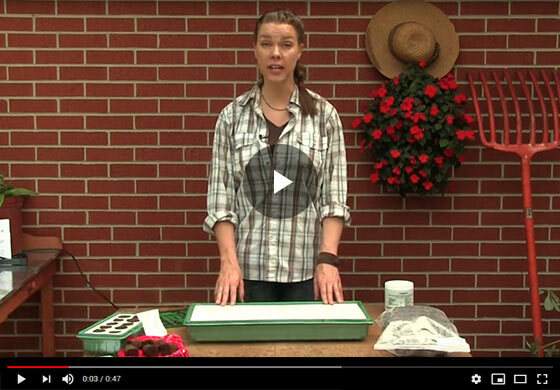 Jenna from Gurney's demonstrates how to start your own seed indoors using Gurney's seed starting kit. Learn the nuances of creating the right environment and providing the necessary care to the young seedlings till they're ready for transplanting. Hi I'm Jenna with Gurney's Seed and Nursery company and today I'm going to be starting some seeds using our Gurney's seed starting kit. This is what your kit will look like when you receive it. As you see, we've got a couple different components here... the first thing you're going to want to do is remove this humidity dome from the bottom tray and set aside. Now we've got the water reservoir tray and the styrofoam growing tray. You have your grow plugs in a re sealable package like this, and you also receive two ounces of our seedling boost fertilizer. This is the 55 cell tray that we offer, we also offer a ten cell kit with identical components. So the first step is to place the grow plugs into your styrofoam growing tray. Usually when you receive these plugs they have a good amount of moisture in them but they're a little dried out. No worries, they're going to soak up the perfect amount of water once we fill the water reservoir tray so you'll see how easy it is to just pop these into the tray, narrow side down. This is my four-year-old's favorite part when she's helping me sow seeds, it makes a really good project for young kids. These soilless grow plugs are constructed of an environmentally friendly biodegradable material which you can just pop out of this tray and transplant directly into your garden. They also feature a pre dibble planting hole that you just drop your seed into, no need to cover. The material allows for efficient uptake of water so that you're going to avoid a lot of your over watering problems in young seedlings like molds and diseases. They also contain a natural beneficial bacteria to enhance seed germination. Now we're all set to plant our seeds. Today, I'm going to be starting some Gurney's Blue Ribbon hybrid broccoli but you can use any size seed in this seed starting tray, in fact, if you're using a larger seated item, this makes another really great part of the project for young children to help with, so you see it's just as quick and easy as dropping the seeds into these pre doubled holes and you're all set the next step which is to fill this water reservoir tray. So you're just going to move your growing tray over to the side fill it about half full with water and then put this back in place. The beauty of this system is that this growing tray floats in the water slightly insulating these grow plugs and allowing them to take up the exact amount of water that your young seedlings need. The next step is to place the humidity dome back on top of your kit. This serves to hold in the warmth and moisture that is critical for seed germination. After about two weeks or when your seedlings are just a few inches tall you're going to want to start adding the seedling boost fertilizer to the water that you're filling your water reservoir tray with. Now these marigold and arugula seedlings are only about a week old but I'm going to go ahead and fertilize them now. The seedling boost fertilizer is the perfect blend of nutrients that young seedlings need for optimum growth. It's going to give them healthy cell wall development as well as keeping their growth sturdy and compact but the nice thing is that it's not ever going to over feed or burn up your tender young plants. I like to fertilize about every week or so you can just make a habit of adding this to your water every time you fill the water reservoir tray. An extra step that I like to take for really successful seedlings is to use a seedling heat mat, like this one that we offer at Gurneys.com and in the Gurney's catalog. You'll see this fits perfectly right under the seed pit like so and this is going to provide that bottom heat which is so critical for warm season crops especially like tomatoes, peppers and eggplants. I also recommend using a sealing grow light like this one that we offer at Gurney's to provide the 12 to 16 hours of consistent light a day that young seedlings need for their best start. This light is really nice because you as your seedlings grow you can easily adjust the height so that it's hovering just inches from the tops of your plants depending on the crop. In several weeks to months, you'll have beautiful, healthy garden ready transplants. We started these tomatoes about eight weeks ago and look at the vigorous root systems on these plants! A few days of hardening off or acclimating to outdoor conditions and these will be off and growing at the Gurney's farm. Until next time, thanks for watching and happy gardening!